My thanks to Mobile Cloth for being our site sponsor again this week. They’re our longest running sponsor and one of my all-time favorite iPad accessories. One I’ve used daily ever since I first tried them out. 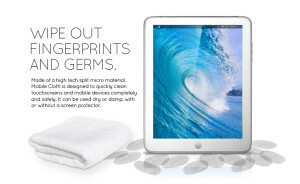 They’re still the quickest, easiest way to clean up nasty germ-ridden, smudged up iPad screens. And the same goes for iPhones, cameras, and assorted other ouch screen devices.